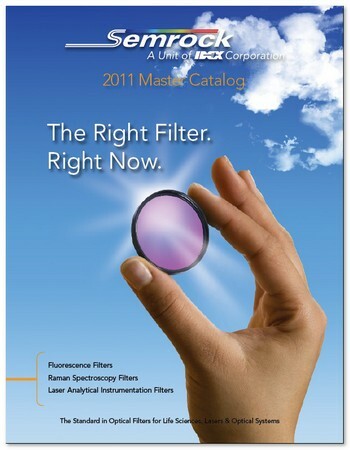 ROCHESTER, N.Y. – Semrock, Inc. announced the release of its new 100-page, full-color 2011 Master Catalog of optical filters and related products. This comprehensive catalog contains fresh Technical and Product Notes along with over 50 new hard-coated filter products for fluorescence microscopy and measurements, Raman spectroscopy, and other laser analytical instrumentation applications, as well as many improved versions of existing optical filters and filter sets. Among the standouts of this edition are two new VersaChrome® tunable bandpass filters, TBP01-380/16 and TBP01-800/12, which extend the range of this unique product line into the UV and IR covering 340 – 380 nm and 700 – 800 nm, respectively. They offer the same angular tuning range of 0 – 60 degrees as the other tunable filters and are ideal for applications from fluorescence imaging and measurements to hyperspectral imaging and high-throughput spectroscopy. Also included in this section are two new Technical Notes devoted solely to VersaChrome imaging. New FRET-Cy3/Cy5 single-band sets have been added for the simplest solution to dual-wavelength imaging. In addition, new information designed to assist in selecting the best filter set and peripheral components for FRET imaging has been included in this catalog. For Multiphoton imaging, the new FF01-790/SP-25, laser-blocking emission filter offers an ultrawide transmission band, from 380 to 760 nm. Optimized to work with this emission filter is the FF775-Di01-25x36 long-wave-pass dichroic beamsplitter with an ultra-wide reflection band, so wide it appears like a mirror when viewed at 45°. For faster selection of multiband filter sets, a new page to select by popular fluorophores has been added that features both non-laser and laser filter sets. Five new BrightLine® single-band sets are listed along with long-pass sets for DAPI, GFP, mCherry, and IRDye800. For the first time, a new company, ATFilms, has been included in the Semrock catalog. ATFilms recently joined the IDEX optics platform. For details on custom low-loss laser optical coatings, superpolished substrates and other precision optics, visit www.ATFilms.com. Exceptional Semrock services highlighted in the catalog include our same-day shipping policy, rapid custom-sizing in under a week, and a 30-day no-hassle return policy. All Semrock filters are covered under the company’s five-year warranty.